This is the second part of my peach and coral lip products for the summer. 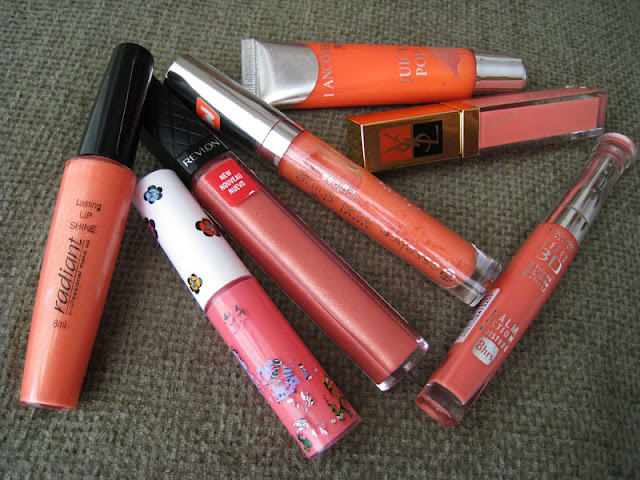 In this one I'm showing you some of my favorite peach and coral lipgosses! This is an old Lancome Juicy Tube lipgloss, it's actually called Juicy Pop, propably because of the bright color. It was limited edition back in 2008 with the Lancome's summer collection. It's a non shimmery neon coral pink shade. In the hand swatch it looks more pigmented than it looks on the lips. It's so pretty and unique! I don't see ofter neon lipglosses, even if they're sheer. This is my first YSL lipgloss, it was released with their 2012 Spring Candy Face Collection. It's a true peach/tangerine shade, with no pink, highly pigmented with gold flecks. It reminds me of the Mac Dazzleglasses but the gold flecks are more gritty. It has an overpowdering mango taste which I don't like. A limited edition shade that it was first released with Mac's Liberty of London collection in the spring of 2012, but I'm pretty sure they had rerelease the same shade with another collection. A highly pigmented coral pink shade with cream texture, no shimmers at all, my favorite texture for Mac lipglasses! And this one is actually one of the few Mac lipglasses that I really enjoyed using, because most of the times Lipglasses are very sticky. A beautiful tangerine shade with silver shimmers with a watery non sticky texture, yes since it's watery it's also sheer but you can see the tangerine shade on your lips, and it's perfect on top of lipsticks, especially peachy ones. It also has a nice fruity taste, not overpowering like the YSL Golden Glosses. In my opinion it's a very affordable lipgloss, and a good opportunity for those who haven't try any peachy lipgloss to try that shade, without paying lots of money. Radiant Professional cosmetics is a greek brand, not exactly a drugstore or a high end one, I would say something in between, and they have a good variety of lipgloss shades. This one was released with last year's summer collection (not sure if it's a limited edition shade), it's a peachy/orange shade with a small hint of pink, highly pigmented with golden micro shimmers. The only thing that I don't like is the taste, it smells a lot like crayons, I hope Radiant will change the taste in the future! A beautiful coral pink shade with silver shimmers, and medium pigmentation. It has an amazing texture, the thickness of the gloss is just perfect, not too thick nor too watery. Bourjois lipglosses are the best lipglosses I've ever tried from a drugstore or high street brand. Actually it beats lots of high end brands too! It's a limited edition shade, it was released with the Sweet Paris Spring 2012 collection, but I'm pretty sure you can still find it in the stores. The Revlon Colorburst lipgloss packaging looks a lot like a high end lipgloss packaging. It's so pretty with a very long sponge tip applicator, like Chanel's, with a unique shade that glides on the lips nicely! Peony is a soft beige-tangerine shade with lots of golden shimmers, and with no taste at all, which is a plus. 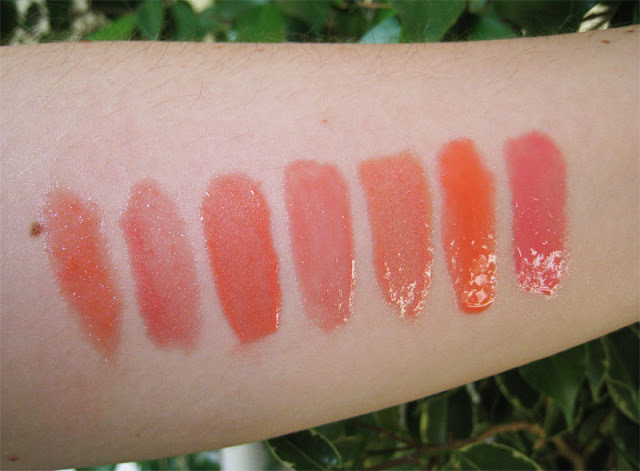 So do you have any favorite peach and coral lipglosses for the summer? Let me know! ahhh, pretties! Mac Perennial High Style looks awesome! Yeah, I hope they will rerelease it in the future! Πολύ όμορφα όλα!Από τα swatches ξεχώρισα της Radiant, της Bourjois και της Mac! 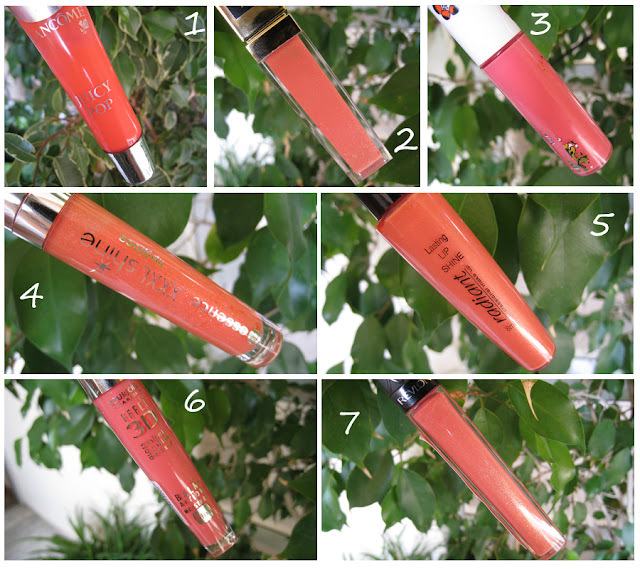 αχ υπεροχα,εχω της Revlon Colorburst Lipgloss το papaya σε παρομοια πορτοκοραλενια αποχρωση ομως εμενα εχει μια μυρωδια και δεν μου αρεσει και πολυ.αλλα το χρωμα το λατρευω. A krima!! Periergo pou to diko mou den exei katholou geusi. Πολύ όμορφα όλα! Της Mac και της Bourjois τέλεια! Πολύ όμορφη συλλογή έχεις!Τις αγαπώ τις ροδακινί-κοραλί αποχρώσεις!